Delcam has added a range of enhancements to its Delcam Electrode integrated solution for the design, machining and inspection of electrodes. The new version includes support for burn-vector electrodes, automated machining of electrode frames, batch processing of multiple machining projects and faster generation of electrode drawings. Delcam Electrode also benefits from a number of options introduced into Delcam’s PowerSHAPE design software which provides the CAD element of the overall solution. Burn-vector or side-sparking electrodes are used to spark undercuts within moulds, including those needed for submarine gates, or to avoid any possibility of a collision when sparking the base of a deep rib or similar feature. They use an arbitrary axis for their operation, rather than being aligned with the principal axes. Delcam Electrode now allows these electrodes to be designed and used with the same quick and easy wizard-based process available for conventional electrodes. 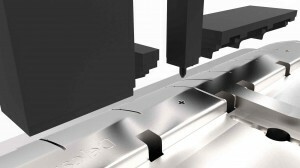 The electrode action can be simulated in the software and the final design passed to Delcam’s PowerMILL CAM system for machining in the same way as standard electrodes.